Price in SEK (Swedish kr) incl. 12 % VAT. English text version below the Swedish. Pluslaktas™ skiljer sig från andra laktaskapslar, då kapslarna inte bara innehåller snabbt, korttidsverkande (ca 30 minuter) laktasenzym utan även bakteriekulturen Bacillus coagulans, som är aktiv under ett par dagar. I Sverige finns ett liknande kosttillskott med minimidoseringen en om dagen, men Pluslaktas™ är, teoretiskt sett, en klart bättre produkt. Pluslaktas™ innehåller nämligen lika mycket laktasenzym, som denna andra kombinationsprodukt, men dubbelt så mycket bakteriekultur! Dessutom är Pluslaktas™ fri från laxerande ingredienser, medan den största ingrediensen i den andra kombinationsprodukten är den laxerande sockeralkoholen xylitol. Laxerande ingredienser hör självklart inte hemma i kosttillskott avsedda att motverka laxering. Doseringsanvisning, ingredienser m m återfinns i bipacksedeln, som även medföljer varje kartong à 30 kapslar. En kartong motsvarar en månads behov vid mimimidos (en om dagen). 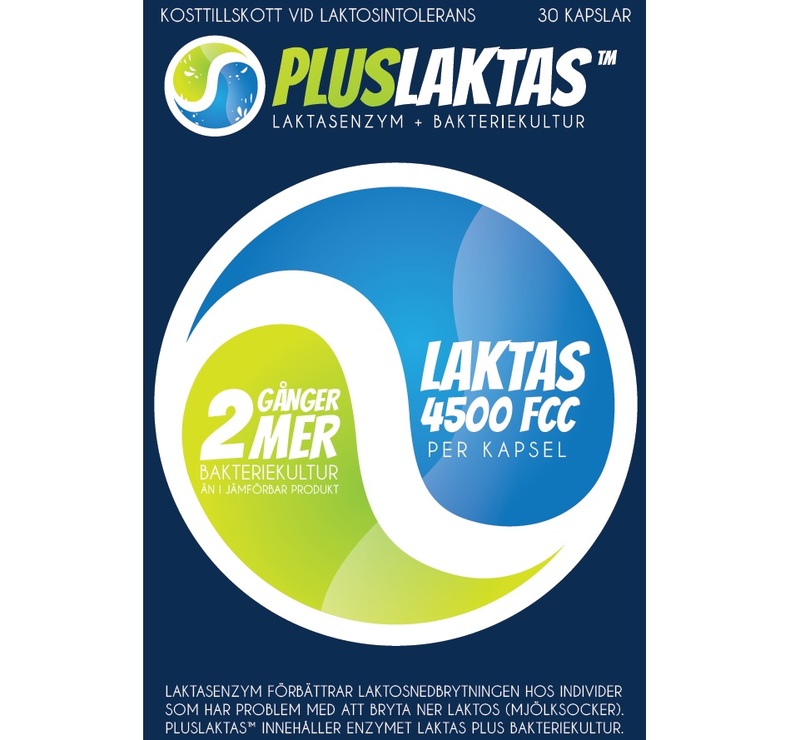 Pluslaktas™ is different from other lactase capsules since the Pluslaktas™ capsules not only contain fast but short-acting (circa 30 minutes) lactase enzyme but also a bacterial culture of a Bacillus coagulans strain which is active for a couple of days. Similar food supplements with one per day as mimimum dose are available but Pluslaktas™ capsules contain more bacterial culture than most of those alternatives. Some lactase products (without and with bacterial culture) contain sugar alcohols like xylitol, sorbitol and isomalt which are laxative ingredients. We strongly advise against using those lactase products since laxative ingredients don't belong in food supplements intended to fight laxation. Pluslaktas™ is free from laxative ingredients. One capsule Pluslaktas™ per day. The capsule should be ingested circa five minutes before the first lactose (milk sugar) containing meal. If you during a whole day don't eat any lactose containing food one capsule Pluslaktas™ should anyway be ingested to make sure that new bacteria are supplied to your digesitive system every day. If one capsule Pluslaktas™ per day doesn't give enough symptom reduction Pluslaktas™ should instead be used like normal lactase capsules (without bacterial culture). Then one capsule Pluslaktas™ should be ingested circa five minutes before each (not only the first) lactose containing meal. 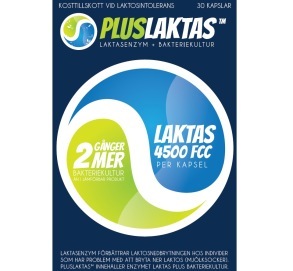 For one or more of these meals Pluslaktas™ can be replaced with normal lactase capsules (without bacterial culture) as long as these capsules also contain at least 4500 FCC units lactase enzyme. The maximum daily dose is four (4) capsules Pluslaktas™ (18000 FCC units lactase enzyme and 8 billion CFU Bacillus coagulans in total). This dose shouldn't be exceeded. One box equates the monthly demand at minimum daily dose (one per day). The capsule shell consists of gelling agent (hydroxypropyl methylcellulose) and colour (titanium dioxide).